We produce a very fruity, dry, soft and sourness rosé wine. To drink young, on cold entries (salads), fishes, shellfishes, light meals, barbecues. It is the wine of the summer par excellence, cheerful and friendly. It is necessary to avoid the over-maturity of the grape. After a short maceration (12 to 24 hours), the grape juice is extracted by "bleeding", this one representing approximately 15 % of the volume of a tub of red wine. 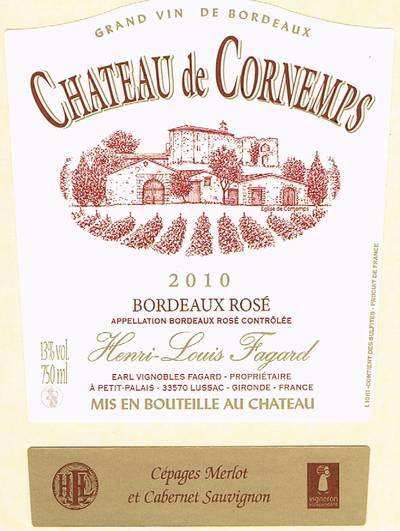 It is thus the best juice without pressurage which is used for the elaboration of the rosé wine. The fermentation takes place very slowly in low temperature to protect the varied and fruity aromas of the grape. The breeding in tubs is short, the bottling is made as soon as possible, from the stabilization of the wine, to protect the aromas.